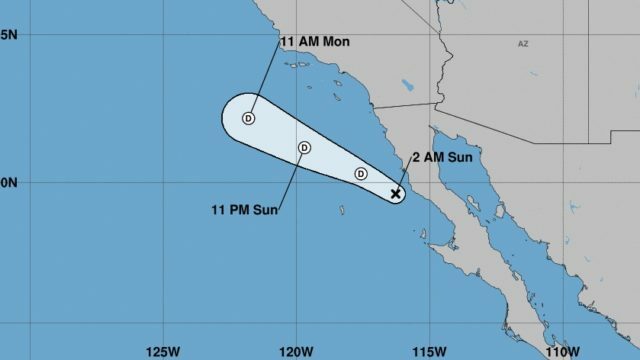 Tropical Storm Lidia’s path off the Southern California and Baja California coastlines. The good news is that San Diego cooled down to 78 degrees late Saturday, but the bad news is that it heated up to above 90 degrees just after midnight Sunday, as hot and muggy air pushed cooling ocean breezes out to sea. And radar showed a mass of thundercells rumbling around the mountains near Mexicali at midmorning, moving northwest and threatening to rain out the afternoon Padres-Dodgers game and commit other mischief. The Padres cancelled pregame activities Sunday, announced that small folding umbrellas would be allowed at Sunday’s 1:40 p.m. game, and reminded fans that the team does not issue refunds if rain threatens. Rainouts are unusual at Petco, there have only been three previous cancellations in the ballpark’s history. 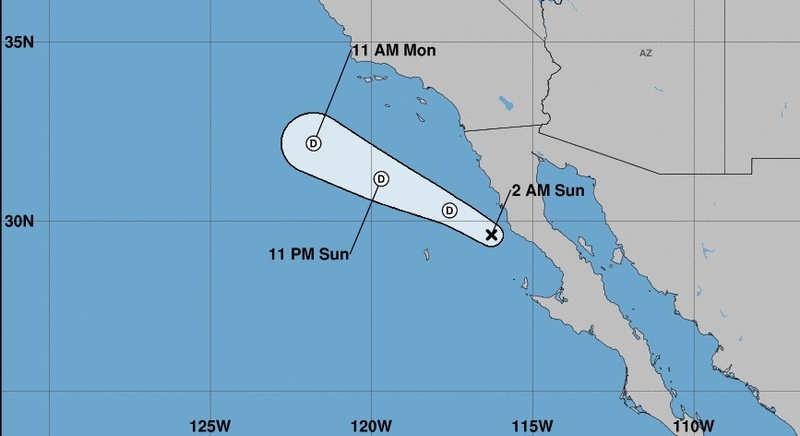 The National Weather Service said the remnants of Tropical Storm Lidia sent winds of up to 55 miles per hour through the Laguna Mountains Sunday, and pushed cooling coastal air away. The temperature at Lindbergh Field had fallen to 78 degrees by midnight – – still warm for the coast ad beaches. By 2 a.m., it had risen to 91 degrees, and it did not drop below 90 all morning. Winds were forecast to blow at 15-25 miles per hour in East and North County, and gust to 45 mph Sunday. They were predicted to decrease Sunday evening.